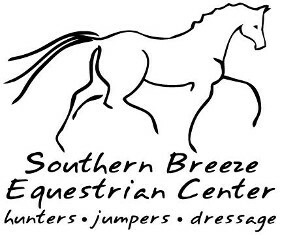 Southern Breeze Equestrian Center in Fresno, Texas, provides a wide range of professional services from boarding and training to educating the rider. We have more than 100 years of combined experts to back our services. The welfare and safety of our horses and riders is paramount. Our family-oriented equestrian center provides 4 groomed arenas, a gated entrance, and a fully fenced perimeter for your safety and the security of your horse. Inside, we offer a clean, air-conditioned & heated lounge with full kitchen and satellite TV. Feel free to sit back, relax, and use our free wi-fi while you do your work or homework, while we train your horse or rider. SBEC offers a full range of riding lessons for beginner through advanced hunt-seat equitation, jumpers, and dressage for all ages. We are also a PATH International registered center with an active therapeutic riding program. Full board with the best of care. Training packages for green horses as well as competition horses in need of a tune-up. Are you looking for a horse to perform in the show ring or a pleasure ride? Visit our For Sale/Lease Page for pictures and descriptions of what we have to offer. We will assist you with finding the right horse, on or off property. 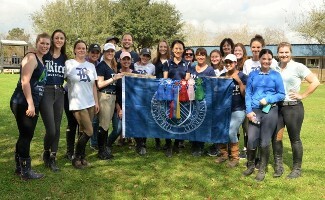 SBEC has been home to the Rice Equestrian Team since 2008, with Cathy Strobel training and coaching the Intercollegiate Horse Show Association hunt seat / jumping team to excellence. We hope you are able to attend the IHSA horse shows held at Southern Breeze, where we host universities and colleges across the region for the competition. We want to thank each and every volunteer that helps to make the shows such a success. 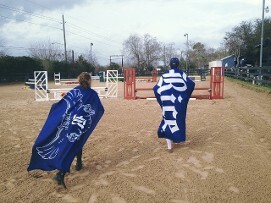 We also thank each of the owners who so generously donate horses for this event. Go to the Event Schedule page for details. Call or e-mail us for more information about our Horse Boarding, Riding Lessons, Horse Sales & Horse Training.